Celebrate Canada Day with this creamy, crowd-pleasing recipe for Great Canadian Potato Salad packed with pickles, red potatoes, egg and red onion. I’m thrilled to have been selected as a #whatscooking contributor for Kraft Canada! In addition to my regular content, I will be sharing posts with recipes, ideas and tips you can use in your kitchen. I love thinking back to past Canada Day celebrations, which have really only happened over the past few years. When I was younger, we’d spend the whole summer in Greece and often that meant we’d either be in-transit or on Kefalonia on July 1st. However over the past four years, working in the summer has meant that I’ve been home to celebrate. Last year that meant getting a sun burn at the Blue Jays game and having a few friends over for beef & mushroom meatball sliders, the year before was a cottage getaway with some friends, and the year before was was a backyard pool party. All very Canadian ways to celebrate, right? 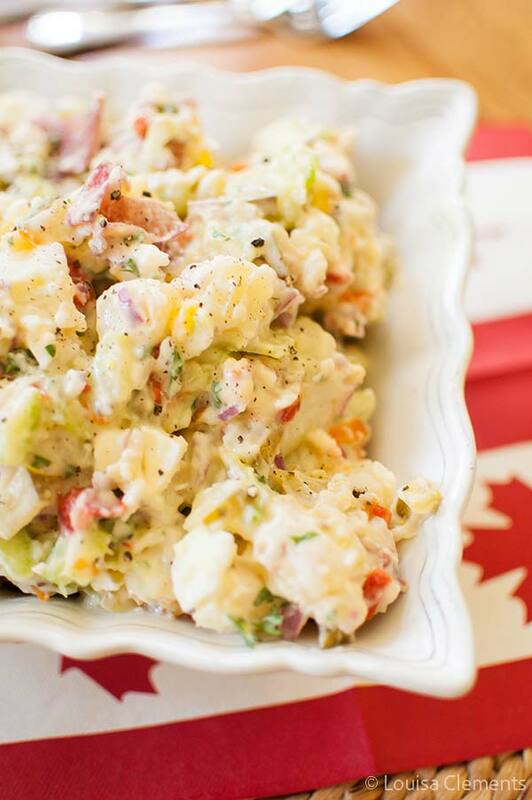 I don’t really have any big plans for Canada Day this year (I may end up playing taxi driver to and from the airport), but I know it will include this great Canadian potato salad. 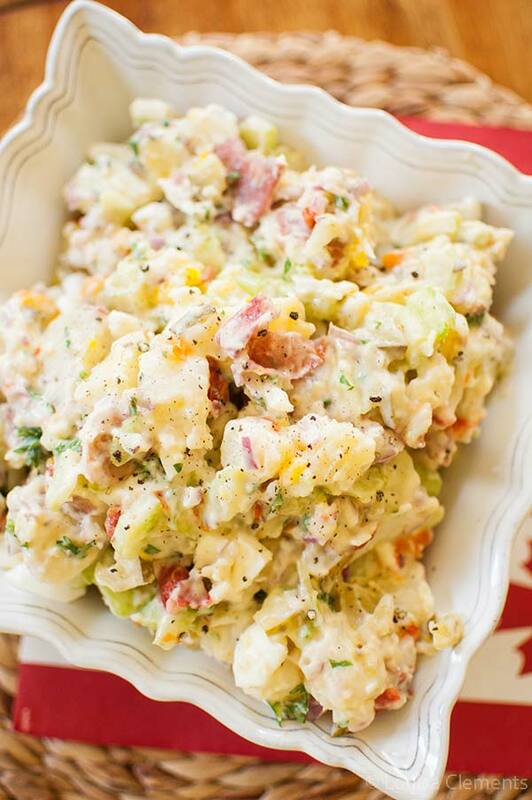 I’ve adapted this creamy and satisfying Great Canadian Potato Salad recipe from Kraft Canada, this summer stand-by is made with all your potato salad favourites; red potatoes, celery, chopped pickles and hard-boiled eggs. The recipe itself is a standout potluck favourite, but I wanted to jazz it up a little (I can never leave a recipe alone! ), I added a hint of spice from banana peppers, and some colour with red onion and fresh parsley. I also switched out the yellow mustard for Dijon, celery seed for dill seed and opted for garlic-dill pickles instead of sweet pickles. Mix first 4 ingredients in large bowl. 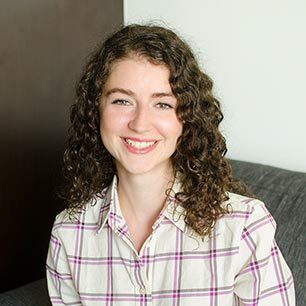 Disclosure: This post was sponsored by Kraft Canada – as always, all opinions are my own. Thank you for supporting my sponsors and allowing me to continue creating content! Thanks Lou! I am going to give it a try! I recently heard that this recipe won an award!